Despite a slightly underwhelming spell at Milan during the first half of this campaign, Higuain remains one of the most lethal strikers of the game in recent history. Yet in over a decade of European football, most strikes the 31-year-old converts is a cross, pullback, throughball or deadball provided by some of the world’s best creators. At Real Madrid, Higuain relied on the metronomic Mesut Ozil for the perfect sliderule passes. At Napoli, Marek Hamsik supplied him with the dinked crosses to convert. At Juve, Miralem Pjanic targeted Higuain for his pinpoint deliveries into the box. Which brings us to Chelsea. The west Londoners’ current struggles in front of the goal are well-documented, with Olivier Giroud and Alvaro Morata failing to find the net on a regular basis for the club. The hope is that Higuain’s landing will propel the Blues to goalscoring heights but this does not account for the fact that there is as much a creativity issue on the pitch as much as there is a finishing one. Of the Blues’ midfield options, only Ross Barkley arguably possesses the knack of a defence-splitting pass. The former Everton ace has three assists so far yet he rarely starts with Sarri opting for Mateo Kovacic. On the other hand, Jorginho’s importance lies in the Chelsea engine room and if he does not provide a lot of chances per se, it is his “third pass”, allowing others to break into space, that opens up the possibility for others to create goalscoring opportunities. And when I say others, I’m referring to Chelsea’s attacking frontline. Willian, Pedro and Hazard have so far combined for 14 assists, with the Belgian responsible for 10 and if the Stamford Bridge outfit are to get their new signing banging goals in on a consistent basis in England, they need to step up their creativity from the wide positions. 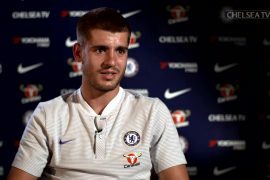 It is a position that former Chelsea favourite and current television pundit Craig Burley pointed out in a recent interview. “[Top four] is not guaranteed but obviously it [Higuain] helps,” said the 47-year-old former midfielder. “But it does put a huge pressure back on Eden Hazard now and also Willian or Pedro or Hudson-Odoi who play on the other side, if he doesn’t go to Bayern Munich. “We’ve talked about Jorginho a lot but when teams start sitting people on him, he’s like a crab isn’t he, he’s passing it sideways, let’s be frank. And then you’ve got N’Golo Kante who’s not going to be creative. He’ll run around and he’ll work. [Mateo] Kovacic is not having a great time, [Ross] Barkley’s been in and out.